This week I've been busy organizing my song files. It always seems like a major endeavor, but it needs to be done in order to stay organized during the school year. One song I found swimming around in my song files was a song I wrote this year about fish. A couple of teachers I work with asked for me to come up with a song to help teach simple things about fish to their students. they swim underwater, they breathe through gills, they have scales and fins and they lay eggs. We used various visuals to show the different parts of the fish while we sang the simple verses in this song. In one class, we also incorporated the sign for fish as we showed a picture of a fish with this song. What are your favorite songs to sing about fish? 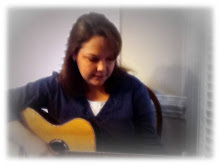 Thanks for stopping by and check back here soon for more song posts! Today's post is a brainstorming of ideas for anyone working on or introducing the topic of feelings in a 1:1 or group music therapy session. Thursday, I posted a song I wrote that I use with students to learn and talk about feelings. You can listen to the song here. When I use this song with students, I almost always incorporate pictures of each emotion. I recommend using real pictures of a variety of children and adults. After singing the song with younger children, you could have an assortment of pictures of each emotion and pass them out to each student in the group. As you sing the song again, students are asked to hold up the picture of the emotion you sing about (there is some time in the song after each emotion is sung). If you are working 1:1 with a student, then there is time for them to find each feeling card and hold it up as it is sung. Another idea would be to sing the song again, and have students sit in a circle and pass the pictures while the song is sung. Whenever you stop, each child is asked to make the face of the emotion on their card. This intervention would help students understand some nonverbal cues (facial emotions), and further develop their abilities to recognize emotional facial expressions. Another idea would be for you to hand out only one emotion card that is passed around as music is played. When the music stops, whoever has the card has to copy that emotion and the group "guesses" how that student is feeling. This would be great for students who need more practice on copying modeled behavior and/or copying an action. Later, you could sit the group in the circle and pass around a single instrument and when the music stops, the student who has the instrument has to play an emotion and the group guesses how that student feels. After labeling each feeling and seeing a visual of that feeling, then you can move on to sessions where you ask, "When do you feel sad?" or "What makes you feel mad?". For students that have a difficult time answering questions like this, you can make simple notecards with situations that will likely occur and then have students pair a feeling picture with that situation. For example, notecards might read, "It's my birthday! ", "I spilled my drink. ", "I lost my iPod. ", or "I got a new puppy!",etc. All of these ideas can be tweaked for different age groups and populations. I hope these ideas are helpful or at least get your creative juices flowing for ideas of your own. I'd love to hear some of your ideas as well! Feel free to comment below! Thanks for stopping by and check back soon for more summer posts! 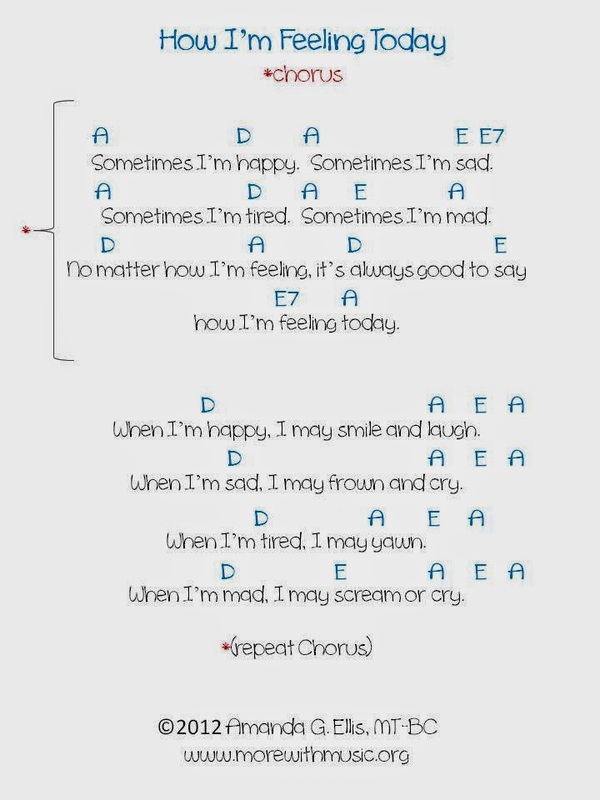 Today I'm sharing the song sheet for the song about feelings that I posted yesterday. The song is fairly easy to play and requires only 4 chords: A, D, E and E7. If you would like a copy of the song lyric sheet, email me your request at morewithmusic@gmail.com and I will send it to you. Stay tuned for an additional post about feelings with ideas for your individual and group music therapy sessions.